The 28th Annual ASCE Bridge Competition hosted 44 bridges from 7 different 5th through 8th Grade groups in Central Illinois. The objective of the competition to design and construct a bridge using standard 3” x 5” (176 mm x 127 mm) index cards. The winning team was judged based on team participation, conformance to the design and construction requirements, a written report, and finally, the performance of the bridge under a dead load. Curtis Lynn and Keith Plavec of Maurer-Stutz, Inc. are the Bridge Competition Co-Chairs for Illinois Valley Branch coordinating delivery of registration packets to schools in Central Illinois, organizing and attending schools requesting an engineer to discuss the competition to their students, raising funds for the bridge competition, raising funds for underwriting admission to the Peoria Riverfront Museum for Engineering Day, and organizing volunteers for pre-judging and the bridge break. Bryan Swanson was one of the judges that reviewed bridges and reports on Saturday prior to the bridge break on Sunday. 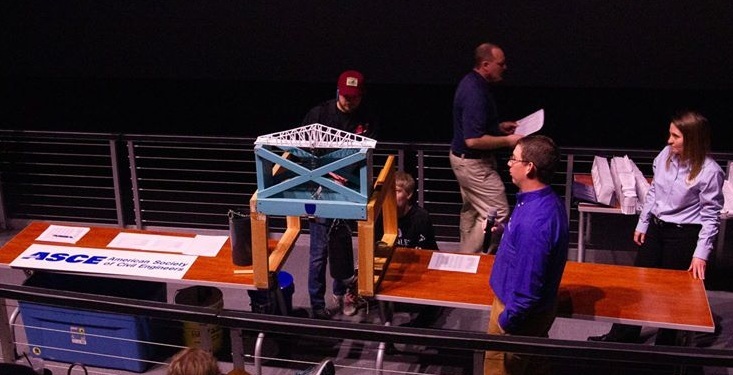 This event was part of the Engineering Day 2019 at Peoria Riverfront Museum which also included exciting & engaging engineering activities will be provided throughout the museum by local engineering groups, who are also sponsoring general admission for this free day at the museum.